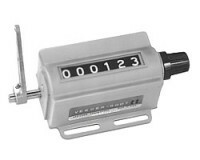 Veeder-Root™ offers the broadest selection of rugged and economical electronic, electromechanical and mechanical counters. Veeder products encompass a complete line of Totalizing, preset and predetermining electronic counters as well as diverse process and rate indicators. Veeder-Root™, the best known name in counters, has provided non-stop performance and production monitoring in industrial manufacturing applications for over 100 years.